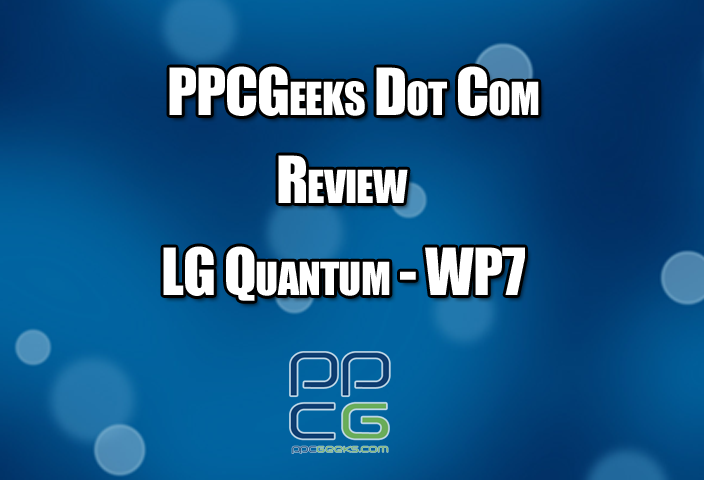 Thanks to the LG Electronics Corp – we were given the unique opportunity to look at the LG Quantum, one of the first Windows Phone 7 devices currently on the market,we took an in depth look at it in this review! Read on to hear our side commentary as well as see the clip itself! We just want to note that this review does have a negative impact on the phone – but this is due to the look at the phones current potential, as opposed to the OSes future potential and implementation. Our users may consider this a negative and at best, pessimistic view – this is because we are approaching the major design / implementation flaws still prevalent in a mature product (It’s been out for several months when we got a hold of it,) not to mention the limited capabilities of the device at hand. BUT, we are also aware it’s in the first 6 months of life since Microsoft unveiled WP7 last November. Like Android, and the G1, we are sure it takes time to invest and develop the product – and that the first of these devices will show as more of a proof of concept, as opposed to what you will see a year from now when the device is ripe. We however are giving the perspective to users who will buy it today – thus we will note the compatibility issues, along with the awesome features and potential we see in WP7. We hope to revisit this review and show the comparison in features and show the development of WP7 much like to Android several years back with the G1. In the end, it’s a solid device in the hardware end, but needs a lot of software revisisions. There is that seamless integration at times – but then you can see the cardboard edges of the set you are placed on, and it ruins the dimensions of in depth and feel of the game. It’s like seeing the stage props occasionally fall over and break – and it hurts our first impression of WP7 – but this is coming from a WM / Android user. Check out Jason Fieldz’s review to see a WM – WP7 impression of the devices from the Surround.